Installing new windows is a superb way to reduce your annual heating bills and raise the energy efficiency of your property. And wooden double glazing is just one possible material to do this with. Double glazing is a proven insulation method for homeowners who want to see cuts made to their energy bills, as units ensure heat is locked in the property and isn’t allowed to escape. Considering windows and doors are two of the main places heat is lost in the home, new double glazed windows are key to cutting expenses. The double glazed window works with two panes of glass separated by an energy efficient spacer, usually Argon. The spacer is normally between 20mm and 28mm in thickness, which is the optimal distance and heat is unable to pass through. With wooden frames you’ll add to the efficiency of the unit, whilst having an aesthetically pleasing outcome that’ll look fantastic. Cut your energy bills by up to £300 every year. 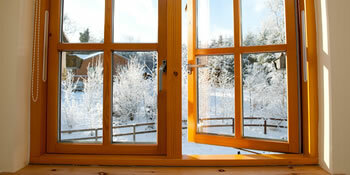 Double glazing retains heat in your home, ensuring you don’t have to turn up the temperature to stay warm. Add security to your property with two panes of glass rather than just the one. Research suggests that potential break-ins are prevented by having double glazing as burglars are put off by the added window pane. Slash your home’s carbon footprint, which is not only great for the environment but is also in line with Government and EU carbon reduction targets. See a reduction in noise pollution that enters your home. With the efficient spacer, noise is kept outside which is even better for properties in busy areas. The main reason for choosing wooden frames over aluminium or uPVC, is because of the aesthetic appeal they bring to homes. There’s no doubt about it, wooden double glazing looks great and is in keeping with traditional properties. It’s also brilliant for energy efficiency and betters aluminium in this department too. On top of this, wooden windows are environmentally friendly as they’re fully recyclable. If you’re interested in wooden windows it’s best to receive a number of quotes to compare prices and ensure you get the right deal for your money’s worth. By completing our quick form we’ll provide you with up to four FREE quotes from local, vetted and reputable window suppliers. The below data displays the energy performance of homes in Uk. Energy ratings vary from A to G, with A being the most energy efficient and G being the least efficient. The Energy Performance Certificate (EPC) rating factors heavily when trying to sell your home, as potential buyers will see what amount they're likely to be spending on their heating expenses. Home improvements including insulation assist to drastically increase a home's EPC rating. The information beneath shows the diverse types of properties in Uk. By far the most commonplace houses all around the United Kingdom are detached and semi-detached households. Various other properties include terraced houses, flats, converted flats and bungalows. The pie chart underneath displays the proportion of houses in Uk that are central heated and non-central heated. Central heating figures in the the greater part of UK homes, including those on the gas grid and properties heated by oil and electric. The information below shows the spread of properties heated by various fuels. Throughout the UK the most frequent hands down are gas heated houses, followed by electricity and then oil. Biomass central heating boilers are also rising in popularity, heated by environment friendly products like wooden pellets or agricultural waste.|Houses in the UK are warmed by a range of fuels, such as gas, electricity, oil, solid fuel and LPG boilers. Each fuel has a varying cost associated with it so you may find yourself with cheaper energy bills by altering the way your house is heated. Even solar thermal panels are being regarded as by many as a way to reduce heating bills for the years to come.